THE GRAPHS THEY DON’T WANT US TO SEE. For all the diplomatic noise, carbon emissions have continued their steady upward march, with the only blip caused by the global economic recession. First, the good news. The 16th meeting of parties to the UN climate change convention in Cancún, Mexico, ended with a wheelbarrow full of agreements, agreed positions and supportive statements aimed at developing a more sustainable world. The parties to the convention — 193 countries including Australia — agreed that it was necessary to cut emissions enough to prevent global warming of 2C or more above pre-industrial levels. They agreed to be more accountable for their climate actions, to set up a $100 billion fund to protect poor nations from climate change and help them develop in a sustainable way, to protect forests in developing countries, and to set emissions targets that get progressively tougher. While the Copenhagen Accord was a single brief statement of intent (it fell far short of a comprehensive binding agreement), the Cancún outcome is in the form of 25 separate agreed positions. Some of these contain significant advances, but they remain works in progress. Without the big-name publicity that constantly disrupted the Copenhagen meeting, Cancún delegates were able to work methodically through some complex points of difference to eke out consensus positions on problems that 12 months ago had stopped Copenhagen in its tracks. The future of the Kyoto Protocol was one of those big sticking points that has long bedevilled the climate change debate. This 1997 agreement saw richer countries including Australia commit to cutting emissions, while developing countries were relieved of this responsibility. This year Japan and Russia refused to commit to an extension of the protocol beyond 2012, a position that saw them at loggerheads with developing nations. A compromise saw the protocol’s extension guaranteed so long as developing countries also reduce their emissions. For the first time in UN climate meetings, the developing powerhouses of China, India and Brazil put their names to a consensus agreement that a low-carbon road is the only viable road for all economies, both developed and developing. It was agreed after the Copenhagen melt-down that national leaders would avoid Cancún. Reputation and pride were at stake here: another failure might threaten leaders’ standing at home, a point well made in the fate of Kevin Rudd post-Copenhagen. So we got the second tier of decision-makers, people like Climate Change Minister Greg Combet and departmental advisers. In the absence of leaders and their retinues, the meeting turned out to be less fraught, more down-to-earth, and more successful. But the success is relative, no more. In the context of what’s happening out there where the problem started — out among the power generators, the miners and heavy industries, the cars and trucks and ships and aircraft that keep us on the move — the Cancun agreements lose their lustre. Take the latest scientific report on global emissions performance, released by the Global Carbon Project just ahead of Cancún. It makes very uncomfortable reading. First impressions are that 2009 was a good year. In a peer-reviewed paper, Global Carbon Project scientists estimated that after years of going steadily up, world-wide carbon dioxide emissions from fossil fuel burning and cement manufacture dropped by 1.3 per cent during the year. But the paper’s lead author, Prof Pierre Friedlingstein, pointed out that the decrease was a result of last year’s global economic downturn — and was less than half what the Global Carbon Project had previously estimated. So without the downturn, emissions would have been higher than ever. Current economic growth indicates that emissions have returned to the old pattern in 2010, more than 3 per cent higher than 2009. Friedlingstein says that global emissions from burning fossil fuels will reach record levels this year. 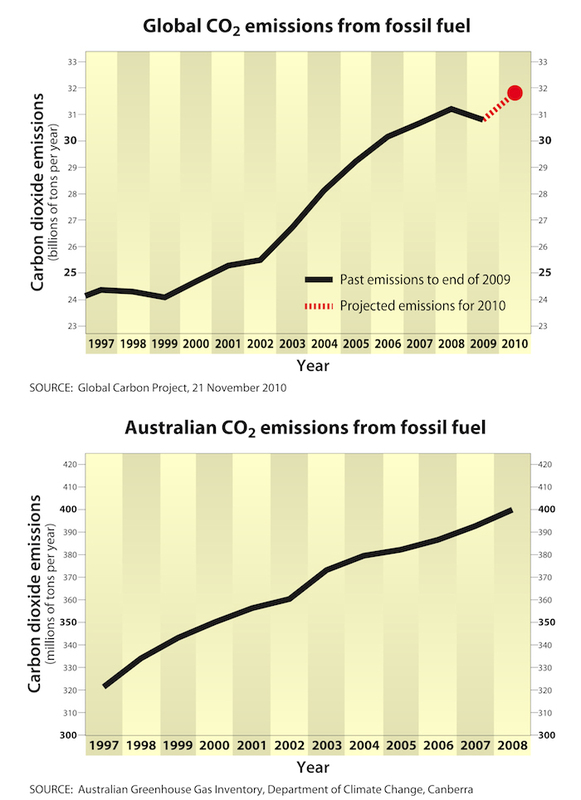 On average, individual Australians are responsible for more carbon emissions from fossil fuel than pretty well anyone. We were a leader of the push in the 1990s to cut emissions, but in 1997 at Kyoto wangled a deal that enabled us to represent our emissions as reducing when in fact they were rising. Now our diplomatic cleverness is coming back to bite us. Our national greenhouse gas inventory shows that our fossil fuel emissions rose by 25 per cent rise over the 12 years from 1997, when we signed the Kyoto Protocol, to the end of 2008 (the latest available data). These are alarming figures. Over those 12 years the public was led to believe that emissions would start to head downwards. In fact the program was failing, due in large part to a well-funded lobbying campaign by an alliance of coal-power generators, miners and energy-intensive industry. Greg Combet won some plaudits for his performance at Cancún, but the real test is back home. Next year the government promises action on a carbon price scheme in the form of a tax, a trading mechanism or both — an essential measure to achieve a low-carbon economy. But this will succeed only if the carbon price is high enough — at a minimum somewhere around $20 a tonne. Word is that in return for its support for carbon pricing, big industry has now persuaded Combet to accept a price less than half that — and to abandon complementary measures such as a renewable energy target. So while our physical situation calls for urgent and decisive action, men in suits devise ways of preventing any such thing, using weasel words to muddy the waters. In ignoring the scientific reality they are betraying us all. This entry was posted in Australian politics, bureaucracy, business, investment, employment, carbon, carbon emissions and targets, changes to climate, climate politics, climate system, economic activity, emissions trading, fossil fuels, future climate, international politics, leadership, public opinion, science, social and personal issues and tagged Australia, Australian politics, Brazil, bureaucracy, business, investment, employment, Cancun, carbon, carbon emissions and targets, changes to climate, China, climate change, climate politics, climate system, Copenhagen Accord, economic activity, emissions trading, fossil fuels, future climate, Global Carbon Project, global warming, Greg Combet, India, international politics, Japan, Kevin Rudd, Kyoto Protocol, leadership, Pierre Friedlingstein, public opinion, Russia, science, social and personal issues, Tasmania, UNFCCC. Bookmark the permalink.